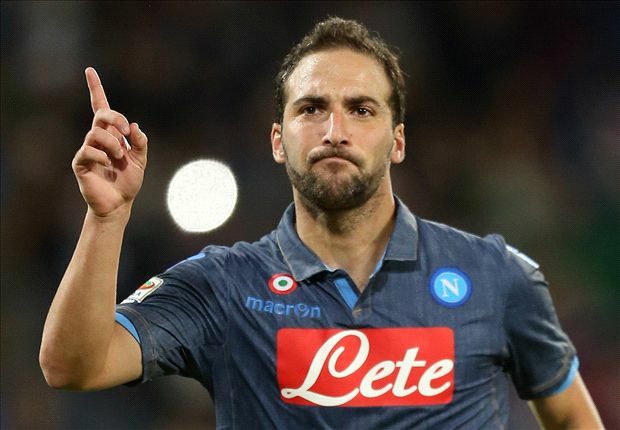 Betting Special: Will anyone pay the price on Higuain's head? With Rafa Benitez gone to take over at Real Madrid and Napoli facing another season without Champions League football, star man Gonzalo Higuain could be forgiven for considering his options this summer. However, club president Aurelio Laurentiis’ insistence that the club record signing will not leave unless a club meets his €100 million buy-out clause has dampened expectations of a transfer taking place, with Paddy Power offering odds of just 5/4 (2.25) on him remaining at the Stadio San Paolo come the closure of the window. Nevertheless, in need of a striker after the departure of Radamel Falcao and with Robin Van Persie potentially on his way out, Manchester United at priced at a mere 7/4 (2.75) to unite the Argentina international with compatriots Angel Di Maria and Marcos Rojo at Old Trafford. Having been strongly linked with the former Real Madrid man before he moved to Italy two years ago, Arsenal are next in line at 5/1 (6.00) to finally seal his signature this time out. After already bringing in Luciano Vietto and Jackson Martinez to replace the Juventus-bound Mario Mandzukic, Atletico Madrid hardly seem worth the 6/1 (6.00) odds to shell out big money once again on Higuain. Instead, Chelsea appear a more tempting option at 12/1 (13.00) as they attempt to replace Didier Drogba and the possibly departing Loic Remy, while Liverpool are on offer at 16/1 (17.00) to make Higuain the fulcrum of a new-look attack next campaign. Although a move away from Italy might seem the most attractive prospect for a player looking to take the next step in his career, Milan are available at 20/1 (21.00) to tempt him to stay in the country for at least six more months. This entry was posted in News on 02/07/2015 by mirsinho.